Two new rare Amur tiger cubs have gone on public display at the Highland Wildlife Park near Aviemore. The BBC Scotland news website revealed in April that Dominika and male Marty, who arrived last year from a zoo in the Czech Republic, had been mating. 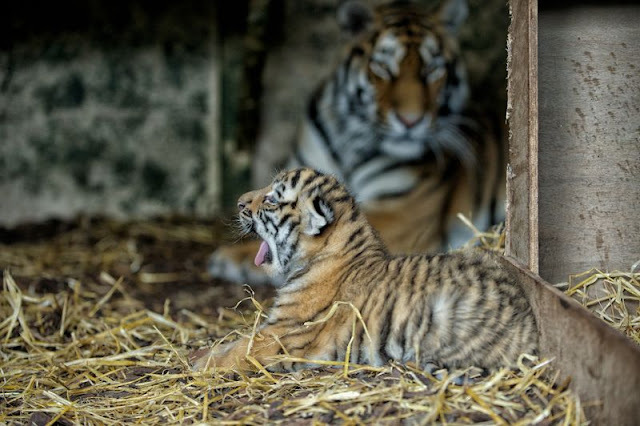 Dominika gave birth to the cubs in May in one of three dens built away from public view in the tigers' enclosure. The mother is one of a litter of three Amur tigers, also known as Siberian tigers, born at the park in 2009. Her siblings are at other zoos. Up to 500 Amur tigers are thought to survive in the wild in the birch forests of eastern Russia. Dominika's mother Sasha was put down in 2011 after her health started to fail and she began exhibiting odd behaviour as she got older. Sasha's long-time mate Yuri had been put down the previous year. Responses to " Rare Amur tiger cubs get their first outing at Highland Wildlife Park "